CHARLOTTESVILLE, Va. (WVIR) - A new Amazon headquarters in northern Virginia will bring thousands of jobs to the area, but its impact may be felt in Charlottesville as well. Experts say the company will bring in billions of dollars in revenue to be used across the commonwealth. During a Tom Tom Festival event on Friday, panelists discussed how the money will go towards things like education and infrastructure across the state. Panelists said Amazon&apos;s presence may also lead to expansion in science and technology fields at universities like the University of Virginia. 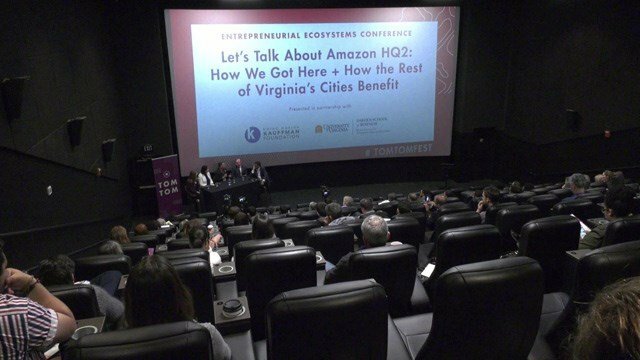 The panel of experts discussed the benefits Amazon will have on the commonwealth. "Charlottesville will benefit by increased activity at the university," said President and CEO of the Alexandria Economic Development Partnership Stephanie Landrum. "Virginia has won the biggest economic development deal in the history of deals and all of the communities within Virginia are benefiting from that positive spin-off." Landrum says site selectors and other companies pay attention to this sort of deal. Amazon expects to move into its Arlington location by the end of this year.